Moving on to Controller tab where control mode settings are concentrated. Tab space is split into three parts: Sensor, Controller and Output. The first one offers a choice of sensor selection which will be used to automate fan/pump control, the second on is where you pick particular control mode and finally Output represents control object. By control object we mean fans, pumps, lamps, LED modules, relay etc. Below will be specified details of each control mode with mainly fans as control object, however, all of that is true for any other control objects we mentioned before. When you first enter this tab, you will find it has already had some control modes set. We have cleared them all so as to demonstrate the main principle on how to set-up one your self. SO, in order to add control mode press “+” in upper right corner of Controller tab. At the time this article was written Aquasuite 2012 Beta 8 has had 5 control mode to choose from. Four of them are dedicated for fan/pump/cold cathode lam control and one specifically for LED module. Since we could not get the last on for the test we will give details only first four control modes. Let’s begin with the most easiest to understand control mode — “Constant value”. In other words, this is manual fan speed regulation mode. Simply set the desired speed for fans and that is it. As this mode does not offer any kind of automation, sensor selection part of Controller tab is disabled in “Constant value” mode. Convenience wise you can set the name for control mode (true for other modes too). “Power” — fan speed on percents. Changed with 1% stepping. Next, you need to select the control object. For that press “+” in upper right corner of Output field. You will then get a pop-up window with a list of Aquaero 5 channels with hardware connected to them and available for controls using this mode. The list includes four main channels, LED module control channel, two additional PWM channels and a relay. We have selected the fourth fan channel with pump connected to it. “Two-Point Controller” mode can provide automatic fan speed control following a simple “turn-on/turn-off” algorithm. In two words, fan begins to spin-up when temperature in control point overgrows “Switch on at” value and drops speed when “Switch off at” temperature is reached. To automate the control process you should pick up a temperature sensor that will have reference on fan speed. 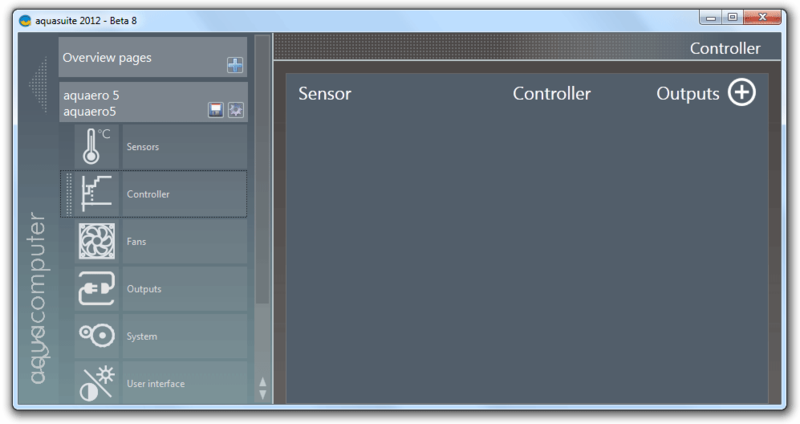 Same as with control object selection you need to click “+” in Sensor field. The list of sensors includes connected temperatures sensors, built-in ones, as well as software and virtual temperature sensors. After that, just add some fans to Outputs field and you are ready to roll. We have chosen 3rd control channel that has fan airing power transistors of Aquaero 5. “Set point Controller” provide more flexible approach for fan speed regulation in reference with changes of temperature in control point. “Temperature” — reference value that controller tends to keep. Ranges from 0 to 120°C with 0.01°C step. “Hysteresis” — create a range of “Temperature” +/- the parameter values. Therefore, fan speed is altered not as soon as “Temperature” value is reached but when temp sensor reading overdoes/undergoes the “Temperature” +/- the parameter level. Ranges from 0 to 10°C with 0.1°C step. “Factor P” — proportional component of the control mode. Fan speed changes proportionally to temperature changes. The bigger the value the more intensively fan speed changes. Ranges from 0 to 10000 with 1 step. “Factor I” — integral component of the control mode. Alters fans speed in reference of time. The longer current temperature in control point higher/lower than “Temperature” +/- “Hysteresis” value the faster/slower fan spins. Bigger parameter values corresponds to faster fan speed change. Ranges from 0 to 10000 with 1 step. Zero value disables the components. “Factor D” — differential component of the control mode. Alters fan speed in only when temperature changes. That is, current temperature value is not so important as temperature difference between values in current and previous time points. The bigger the difference the bigger is fan speed jump for that time interval. Bigger parameter value refers to smaller time interval. Ranges from 0 to 10000 with 1 step. Zero value disables the components. To create a custom curve you need to set 16 points. The X axis represents temperature from -40 to 100°C. Fan speed is assigned to Y axis and varies from 0 to 100%. The curve is easy to alter, therefore the whole control mode is not hard to set-up at all. “Linear” and “Progressive” buttons are to help user create a desired curve. For example, the last one forms and exponential curve. Then you can customize it as you like. To set the time interval for control mode you need to alter two sliders located under the graph. By moving them left/right you will get the desired control time interval. For example, the screenshot above has time interval set to 24-38°C. Well, after deep look into fan, sensor and control mode setting it is tome to try them out. Among four of control modes we detailed above only three of them provide automatic fan control. Exactly those three control mode will be tested below. Now you see, there is only one sharp fan speed change. To sum up, immediate control mode reaction to temperature exceeding the set range is considered as its main advantage. On the other hand, rapid fan speed change brings noise discomfort to your system. We do not recommend this control mode for automatic fan speed management during daily system use, unless your fans are quiet to you even at its max power. However, that does not make Two point controller mode useless. The speed this mode reacts to changes in your system can be use as a safety measure, for example, immediately shut down your PC in case of alarm event. These are default settings offered by Aquasuite 2012. We only changed the reference temperature to — 31°C. Same as above, we use “Hold minimum power” feature at 700RPM, max fan speed — 1200RPM (90%). Aquaero 5 tends to keep the temperature at its reference value by gradually adjusting fan speed. When fan speed reached its max speed at 85% power during test run temperature in the control point began decreasing. Shortly after temperature stabilized at 31°C fan speed slowly decreased to 70% and remained so till the end of the test run. Surely there is not limit to perfection, therefore you can play with settings to get faster fan speed stabilization thus slightly reducing noise level generated by the system at load. In general, “Set point controller” fulfilled his job pretty well by correctly controlling fan speed in order to hold temperature at a set level. Considering the results we got with previous control modes we created our own custom curve for fan speed in reference with temperature in control point. The table below contains all sixteen values of fan power and assigned temperature levels that form the curve. Here we should note, that fan channel settings has speed limits set from 42% to 90%. This range is considered as a 100% when configuring control mode. Therefore 50% of fan speed in fan settings and 50% of control mode work is not the same. Keep that in mind when entering fan power values for custom curves. At the start fan speed changes as fast as the temperature does. Next, due to great system inertance, fan RPM increases more smoothly till the temperature reaches the steady-state value. In fact, the last one have not reached desired 31°C mark. Meantime, max fan speed has stabilized at 72%. Thus, we got the most efficient mode for our system without trying hard. Time to conclude on control modes of Aquaero 5. “Constant value” mode needs no detailed comments. It should be used when you need fan/pump/etc. to run at constant speed regardless of temperature changes in system. “Two point controller” in our opinion is of little use to automatic fan control due to sharply changing noise level. This mode is more suitable in case of system warning/alarm event when high fan RPM can save your system from overheating. “Set point controller” is quite a flexible too to adjust fan speed in reference with controlled temperature, but requires understanding of PID-control principles. Otherwise you can spend many hours figuring out what settings are best for your system. A much faster and easier way to do so is to use “Curve controller” — its graphic outlook makes easy to understand and adjust which will be highly evaluated both by beginners and advanced users.